The future of home just got a step closer with the latest update to the Alarm.com Skill for Alexa. You can now use voice control to activate Scenes—customized combinations of multiple actions from different Alarm.com-powered devices—for the ultimate in smart home convenience. A single spoken command is all it takes to make things cozy for movie night, or secure your house at bedtime. You can also now use Secure Commands, a new type of PIN-enabled voice command that adds an extra layer of security to the convenience of the Alarm.com Skill. Here's what's new and what you can do. 1: Raise your voice; cause a Scene! No longer limited to single device commands, our updated Alexa Skill truly fulfils the promise of voice control. Scenes let you control several devices at once with a single command, adjusting your security system, thermostat, locks, lights, shades and more into useful preset configurations. Alarm.com starts you off with four Scenes - Home, Away, Sleep and Wake Up—and makes it easy to create new ones in your web dashboard for different occasions. 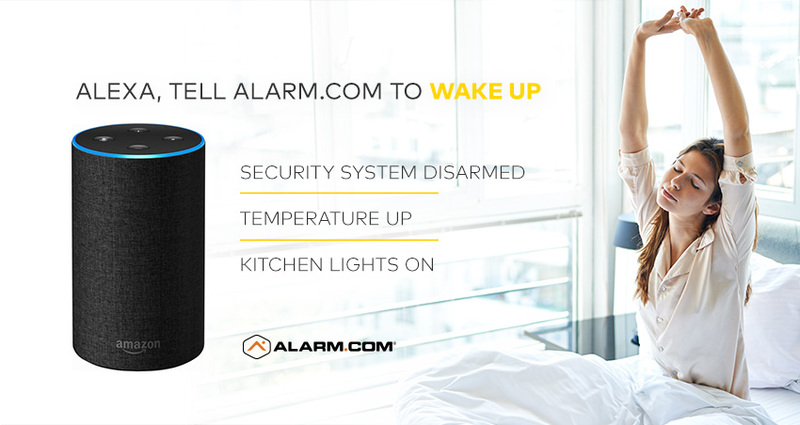 "Alexa, ask Alarm.com to Wake Up." 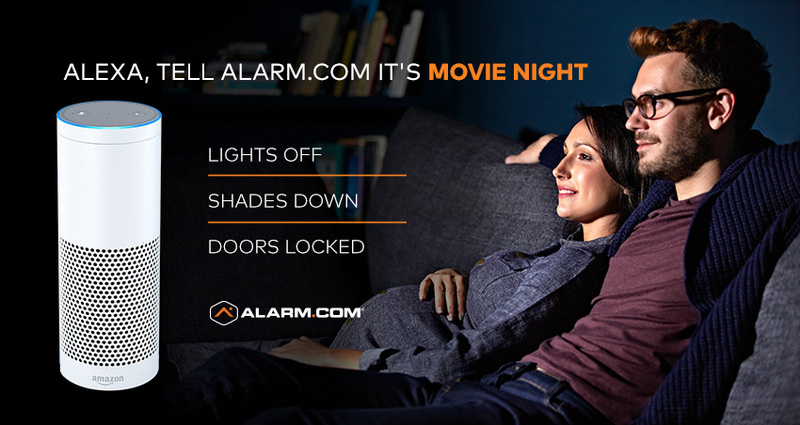 "Alexa, ask Alarm.com to run Movie Night." Not familiar with Scenes? Click here. Also included in our updated Alexa Skill are optional Secure Commands, which let you ask Alarm.com to unlock your doors, open your garage, and disarm your security system using a four-digit PIN. The PIN is an additional layer of security to ensure that only you and your family can issue these sensitive smart home voice commands. When you give a Secure Command, or ask for a Scene that includes a Secure Command, Alexa will prompt you for your PIN. To set up your PIN and enable Secure Commands, you'll need to unlink, then re-link the Alarm.com Skill in the Alexa store. You can now use voice commands to activate advanced security controls, including Arm Night mode, partitions, and specific arming settings like Silent Arming and No Entry Delay (depending on your security panel). For increased security, we've added two-factor authentication to our Alexa Skill, enabling you to authenticate your home's Amazon Echo devices. If you have two-factor authentication turned on, you'll be sent a six-digit code on your smartphone next time you talk to Alarm.com. To authenticate your device, you'll need to say: "Alexa, tell Alarm.com to authenticate with code (*say your code here*)." 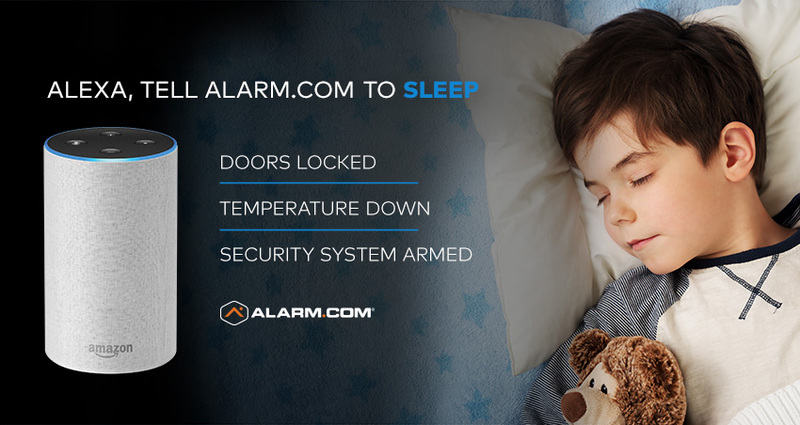 For more ways to control your Alarm.com-powered smart home, click here.